I got my first taste of Emily Dickinson in university. Don't ask me why it took so long, but I quickly discovered that she was a beautiful poet. This poem is the one that has stuck out in my mind the most -- and it wasn't even one that I chose to write a paper about. Every once-in-a-while it pops into my head, and so this time it popped into my head I thought I'd share it with you. 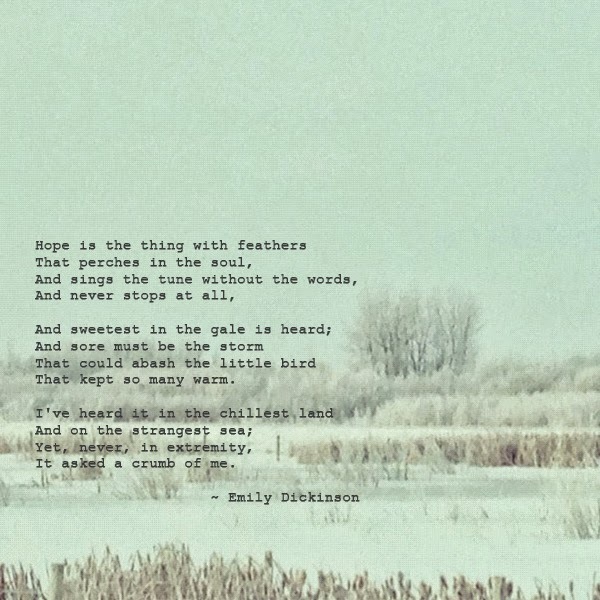 Today is a gloomy and rainy day where I am, but "Hope is the thing with feathers..."